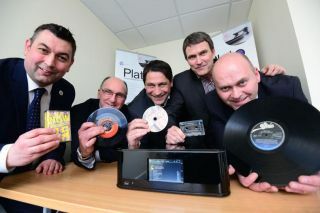 Bristol Show 2015: Entotem unveils Plato high-res audio and video system | What Hi-Fi? Multimedia home entertainment system combines a pre/power amp with built-in 2TB hard drive for video and high-res audio recording and playback. Entotem was founded in 2013 with the aim of developing a multimedia home entertainment system integrating high-resolution audio capability and high-definition video. At the Bristol Show 2015, the company has unveiled Plato – a system that it believes does just that, supported by the Android OS. It combines analogue and digital playback, with high-res recording capabilities up to 24-bit/192kHz. It will also offer video streaming to your TV and audio via a home network. Under the bonnet there's a built-in preamp and power amp combined with a 2TB hard drive. The system connects with your existing hi-fi equipment such as a record deck, cassette player, TV, CD, DVD or Blu-ray player. Plato can automatically record from all your devices then store your record, CD, video and DVD collections in a single place. (DVD and film formats need to be converted on a PC first and then transferred by USB to Plato). "The ability to store Blu-rays and DVDs effectively makes this a film library, and using industry standard protocols, it is possible to stream your music and video around the home," says Entotem managing director Martin Boddy. There's an Android app for controlling the system (iOS will follow), and Plato can integrate with other DLNA (Digital Living Network Alliance) such as Sonos to provide different music in different rooms around the house. Internet radio and Spotify can also be played through Plato. The integration of Gracenote means music recorded to the system can be easily accesses as the track/album artowork is displayed on the front screen. Last night Entotem won a Clarity Alliance Award for the most innovative room at the Bristol Show.